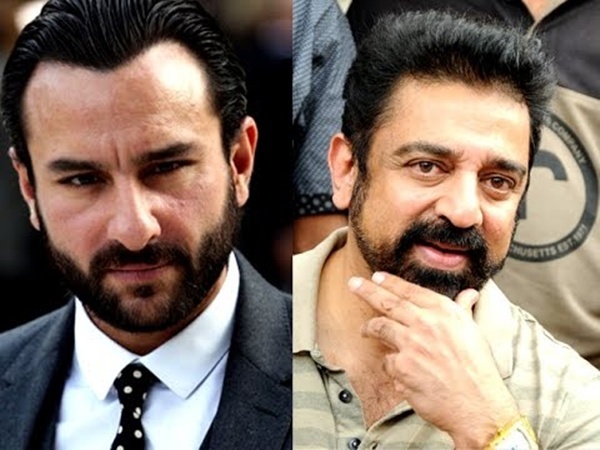 Kamal Hassan and Saif Ali Khan team up for a Tamil-Hindi political thriller, with a score by A R Rahman. IMAGE: Karthi, Dulquer Salmaan, Mani Ratnam. After the acclaimed O Kadhal Kanmani, Mani Ratnam's upcoming project, a yet-to-be-titled film starring A-listers Karthi, Dulquer Salmaan, Nithya Menon and Keerthy Suresh, is creating expected buzz. Latest reports suggest the film will be a bilingual, to be shot simultaneously in Tamil and Telugu. While the Tamil version's cast remains the quartet mentioned above, Mani Sir is currently on the lookout for a suitable cast for the Telugu version, which has resulted in the project, initially scheduled to go on floors in December, getting delayed. A R Rahman (who else?!) will score the music while Ravi Varman will be behind the camera. Father-son duo Sathyaraj and Sibiraj, who star in Dharani Dharan's horror thriller Jackson Durai, have set a personal record by completing the shoot in just 35 days. Dharan's debut film Burma was shot in record time too. Produced by M S Saravanan, Jackson Durai stars Bindhu Madhavi as the female lead and Karunakaran, Motta Rajendran in significant roles. After four back-to-back films with composer Ghibran, Kamal Haasan is all set to collaborate with A R Rahman for his next film, Thalaivan Irukkiran. A bilingual (Tamil and Hindi), the political thriller is titled Amar Hain in Hindi, and will have Saif Ali Khan share screen space with Kamal Haasan. Kamal Haasan and A R Rahman last worked together 15 years ago -- for K S Ravikumar's 2000 dramedy Thenali. Why did 65 infants die in Odisha? What Sridevi, Aishwarya and Rekha have in common!